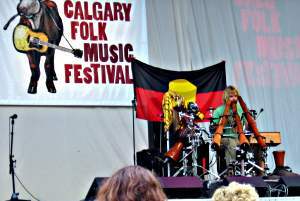 Can't get too much folkier than a stage full of three didgeridoos, guitars, tongue drums, djembes, harmonica and banjo. Unless they're all wielded by one guy named Xavier Rudd with a social conscience represented by the red, yellow and black Aboriginal flag. Whew.